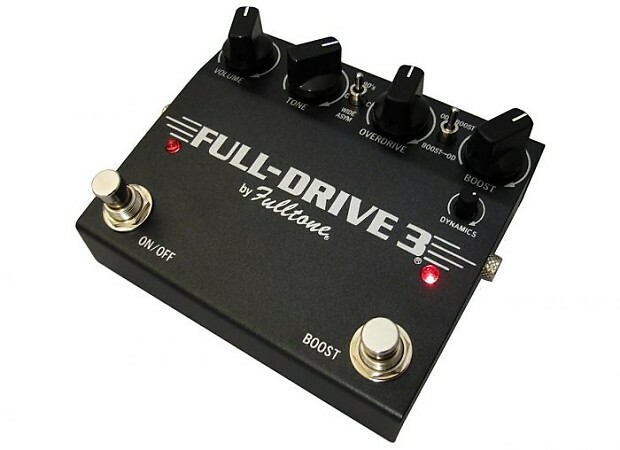 Today I received a Fulltone Full-Drive 3 FD-3, with an extremely minor cosmetic blemish (I'm not even sure that I've found it!) that had Mike Fuller offering it up for $99... ! Full warranty, guarantee, and return policy, free shipping, no taxes, battery included! It's a keeper! It sure is a great and versatile pedal, like a much improved upon Tube Screamer in some ways, with a lot of options. It does what I wanted it to do, which is work well going into a clean tube-amp with some of my other pedals, particularly a Fulltone MDV-3 MkII authentic Uni-Vibe stylee, and also clean-up well with a twist of my guitar's volume-knob and a little English on my "touch". Overall it's a fairly amp-like overdrive feel and tone, particularly on the "Comp Cut" and "Wide Asymmetrical" Clipping Modes. The foot-switchable, adjustable Boost can deliver a little (or a LOT) more volume, and when placed first in order before the Overdrive side, it can dial-in the perfect amount of extra overdrive/distortion and volume-boost for leads and fills. The Boost's Dynamics control, a Limiter using germanium diodes, is very useful for adding 'MORE' at a stomp, with just the right amount of rounding, fattening 'squishy' compression without being too spikily loud and harsh. The Dynamics control is a wonderful asset here! The Overdrive and Boost sides can be used together, in either order- OD > Boost, or Boost > OD (my preference)- or they can be used independently. The pedal has PLENTY of output firepower on-tap to drive a tube-amp into overdrive and distortion, as well as providing its own clipping for overdrive tones. I had read that many found it to be a very 'dark' sounding overdrive pedal, but that has not been the case here. I don't have to turn its Tone knob up very far past Noon at all, really. It often sounds and feels as if there's a bit of a blend of buffered clean/direct signal mixed in with the overdrive, like a preset low amount of Sparkle-Drive type action. Not a bad thing at all! And maybe there is, maybe it's not "just me". It should be no surprise that it works particularly, wonderfully well with my Fulltone Octafuzz, and also quite well with my MDV-3 and Clyde Deluxe pedals, as well as getting along just fine with my pedals from other makers. 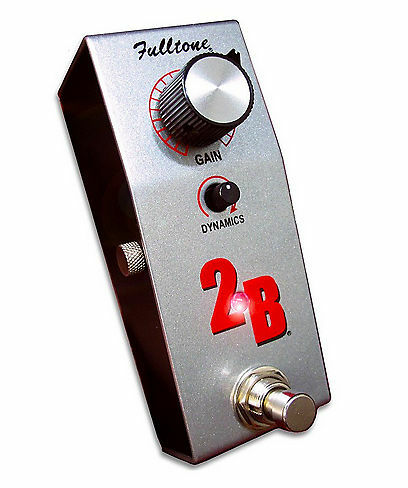 I highly recommend that youze all check out the great deals on fantastic brand-new, fully-warranty pedals at Fulltone dot com > Store > Catalog > Cosmetic Blems. I'm going to wind up with a whole bunch of excellent Fulltone pedals! I like the separate boost and distortion feature. The earlier ones didn't have that, and it makes it much more versatile. And I might just wind up getting a 2B (pronounced, "Tubey" ), which is JUST the Boost and Dynamics/Germanium Diode Limiter (two knobs, one big, one little) from the FD-3, in a small pedal; it'd make a GREAT buffer (the buffer on the 2B is always on, whether the Boost is on or off) at the end of a pedal-chain... $89, brand-new, "blem"! I've gotta say, that the surprise here is just how much I've come to really like the Boost/Dynamics/germanium Limiter side of the FD-3 (the same as the separate 2B Boost/Buffer). I've found that I love the feel and tone of the Boost by itself- with the Overdrive turned off- just hitting the input of a clean tube-amp. Not really overdriving it, but making the sound fuller, fatter, louder, more present and subtly compressed, all the while sounding and feeling warm, natural and very "tubey"! What a win-win-win-win, finding this pedal to be a great overdrive, boosted/lead overdrive, buffer, and clean-boost all in one! +1 I love a clean boost pedal and I'm currently in a trade with a buddy to get my Tech21 Blonde pedal back! It too, can get some nice overdriven/distortion and/or just a clean boost of the old Fender Blonde tube amp sound. I like having a boost pedal for kicking in the lead work and then falling back to the selected rhythm volume without having to touch the guitar knobs. Works much better than a volume pedal by taking the guess work out from the start to the finish on a gig...glad you found that FD-3 and it's working for you! Of course you play guitar, Caev! Who would be dumb enough to hang around a site like this as long as you have if you didn't?